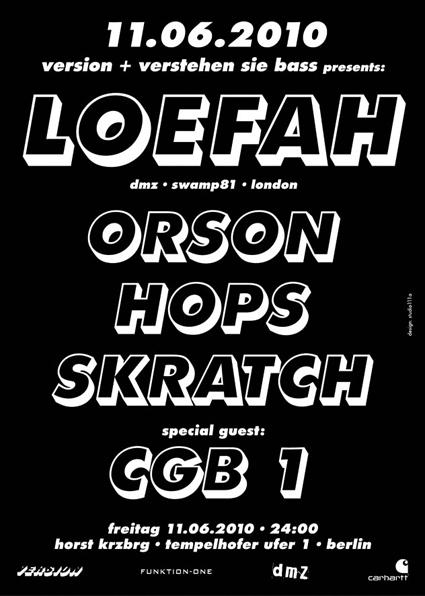 The very special guest is Loefah, one of the original Dubstep pioneers from Great Britain. The man who co-ran the legendary DMZ label and now directs the Swamp81 label, is always good for some extraordinary propulsive, sparse rhythm and low bass frequencies. The other DJs are Orson, Hops, and Skratch. As a very special patron also CGB 1 from Berlin will deliver some all-time Dub classics. Be ready for massive sound sculptures, built-on omnipresent sub-basses, propelling rhythms, randomly twisted samples, and occasional vocals.